Spring is in the air despite it being January. Days are getting longer, snow is melting (albeit being covered again at times), and pets are beginning to shed their winter coats. For many of us, spring is one of our favorite times of year. Many of us look forward to spring break, especially if we have kids who escape school for one whole week to recharge and refuel for the final push to the end. Trips to the beach are popular, or anywhere warmer than where we are. When we go to the beach, we want to look our best. Microneedling is a non invasive cosmetic surgery that uses tiny pin pricks to stimulate collagen production in your skin. Collagen is a protein that keeps your skin elastic and firm. As you age, collagen production decreases, contributing to fine lines, wrinkles, and sagging skin. Microneedling is designed to trick your body into repairing itself by producing more collagen. The results are astounding: diminished signs of aging, a decrease in the appearance of acne scars and stretch marks, and even a stimulation of hair growth. If you’re planning a spring break getaway (or even if your “getaway” is just days of relaxation), your preparations need to begin now. MDPen, a leading supplier of microneedling equipment, supports microneedling practitioners. From microneedling pens to marketing materials and products for microneedling aftercare, MDPen’s mission is to be the one-stop shop for practitioners. We offer micro needling training courses as well as advanced workshops for those interested in learning more about microneedling. Contact us today if you have more questions about how you can become a MDPen practitioner. Below, we’ll go over steps you should take if you are planning a spring break trip and are looking to squeeze in a microneedling procedure. Schedule ahead of time. Skin needling aftercare is not extensive but does take a few days. Immediately after your microneedling procedure, you’ll want to not put on any makeup for 48 hours. Your pores are still open, which is good because now is the time to infuse microneedling serums, which will penetrate to the deepest layers of your skin easily. Our Moisture + Recovery Gel Mask with Human Growth Factors is recommended following treatment. Allow this to sit on your face for at least 10 minutes to allow for maximum absorption. This specialty serum will help collagen production as well as add much needed moisture to your skin’s cells. It will also help with inflammation. Other great options from MDPen’s proprietary skin creams is our Pure Hyaluronic Acid Serum and our Cellular Renewal Serum. Both will help plump up the skin and promote cellular renewal. Ask your practitioner for which is best to use when. Take your vitamins. Proper nutrition is vital to all of our body’s systems, including our integumentary system. Eating healthy and making sure you are eating plenty of foods high in vitamins A and C will help in collagen formation. Take vitamin supplements if you feel you are not getting enough in the foods you eat. Stock up on sunscreen. Spring break usually involves the sun. If you’re going to be out in the sun, you’ll need sunscreen, especially if you just had a microneedling procedure. As long as it’s been over 72 hours since your microneedling session, you can lather on sunscreen till your heart’s content. Invest in a sunscreen that is all-natural and that will also add moisture since the sun will dehydrate your skin.The sun causes the most damage to our skin, so it’s imperative you always wear sunscreen when outdoors. Remember to apply regularly as well. Most sunburns happen when the initial round of sunscreen wears off or after a trip to the water. Avoid any harmful irritants on your skin. This translates as sand to all you beach-lovers. Part of the success of a microneedling procedure is in the aftercare, as in most procedures, be it major or minimal. Your skin is healing, and you’ll want to make sure it can do its job unhindered and as easily as possible. Sand, dirt, and grime can clog pores and irritate the skin, which could cause the collagen production to be delayed. Hydrate. You’ll want to drink lots of water before and after your microneedling procedure. You’ll want to do this always for good health, but water will help keep your skin looking its best and will help the healing process and speed it up. Avoid items that will dehydrate you like alcohol if at all possible, especially for the first week or so. Enjoy your trip. You’ve worked hard for a break. Whether you’re hanging around the house, going on short day trips, or heading to the Mexican Riviera, the most important thing is to have fun! Enjoy the compliments. If you’ve planned your microneedling procedure a few weeks ahead of time (which we recommend), then you should be seeing the amazing effects — and others should be noticing as well! When complimented on how well you look, politely say thank you and inwardly, love the inner glow you feel. MDPen loves to make people feel better about themselves. We exist because of our clients’ desires to look more youthful and feel more youthful as a result. Microneedling leads to amazing results, as old collagen fibers are reorganized and new collagen, elastin, and capillaries are laid down as well, in effect tightening the skin. Microneedling is now being used in combination with other non invasive cosmetic procedures as well, such as with radiofrequency and PRP (platelet-rich plasma) therapy, which is delivering even more amazing results as your skin is receiving twice the boost. Microneedling is for those who are unhappy with the appearance of their skin. 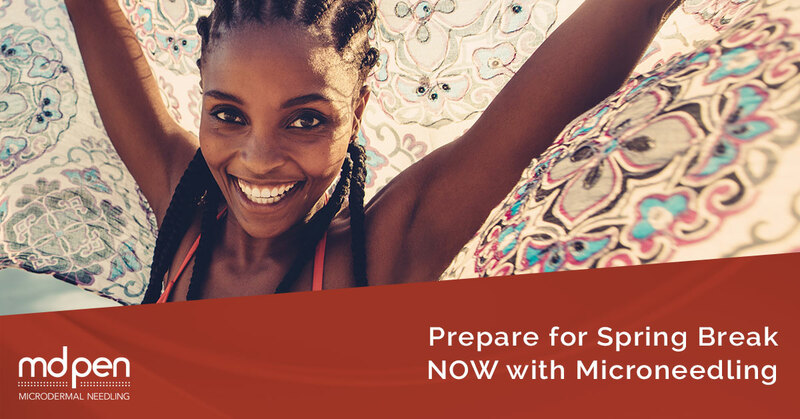 Effective on all skin types, microneedling can give you more self-confidence and more desire to step outside of your comfort zone as your face rejuvenates in just weeks. Proper care is crucial to maximize your effects of microneedling, which your practitioner will review with you. Spring break and vacations are fun, especially if you feel good about yourself and your appearance. MDPen understands it’s not easy some days. Some days you wake up and feel blah, a lot of the times due to reasons outside of your control, for example if you didn’t sleep because your child was sick or hormones are all out of whack. Sometimes it’s the little things that make us feel better about ourselves, like when your child tells you you’re beautiful when no part of you believes it (isn’t that why we have kids?). Microneedling can help you feel beautiful on more days. And that’s a victory. Contact MDPen today to find a professional microneedling practitioner near you!